Lead is finally releasing a new single on August 8, 2009! It’s called “GiraGira Romantic” and has FOUR ‘effing versions. WHY!? This song better be worth it! That last single, “Sunny Day”, was not as good as the previous single. And with a title like that, I’m sure it’s going to be some up-beat song. Lead… you’re sooo good! But when you release stuff with title’s like that of course no one’s going to think your good! PC and VF need to do a better job with you! Each version will feature one member and contain 3 songs. You also get a DVD and photobook to boot! 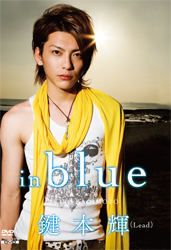 Akira has release a solo DVD called “in blue”. It’s a documentary from “The Television “HOMME” DVD series”. It’s drop date is July 1, 2009 only costing you 3,900yen for a whole 70 minutes of Akira! And if you live in Japan, 500 people will receive a “special item present”. WTF aren’t I in Japan again? Oh yeah cause I want to go to Seoul.